1. 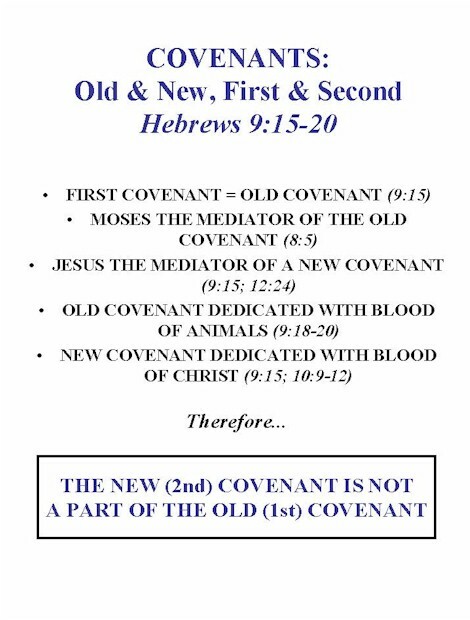 Some brethren are advocating that there has always only been one covenant, and the prevailing idea in the church of an old and new covenant is at best misguided, or at worst, hypocritical and heretical. 2. What saith the scriptures? b. 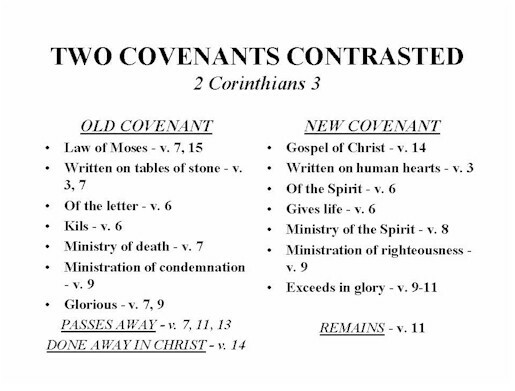 Does the Bible say there was an old covenant and a new covenant, different in their scope, their commands, their capabilities, their promises, and their blessings? A. God Made A Covenant With Israel (The Law Of Moses) - Exo. 19:5-6; 24:8; Deut. 4:13-14; 5:2. 1. 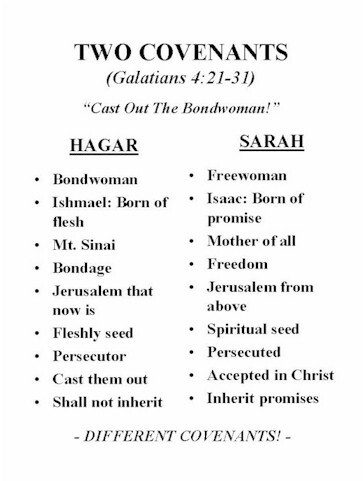 It was not made with "the fathers" (Abraham, Isaac, Jacob, etc.) - Deut. 5:3. 2. It was mediated by Moses - Gal. 3:19. 3. It did not exist before Mt. Sinai (the time of the fathers). 4. Therefore, it is not the "one, everlasting covenant." B. The Covenant God Made With Israel When They Came Out Of Egypt Has Now Become Old - Jer. 31:31; Heb. 8:13. 1. 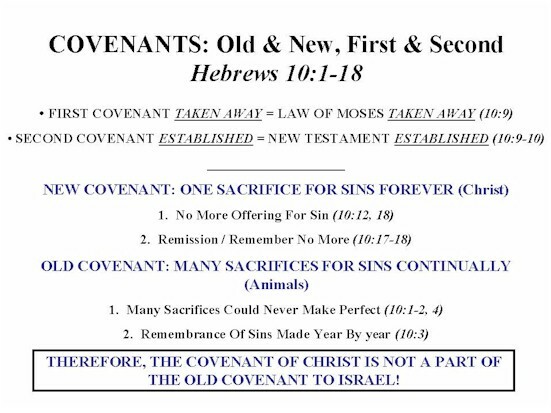 The "new" covenant is distinct from the one made with Israel - Jer. 31:31. 2. 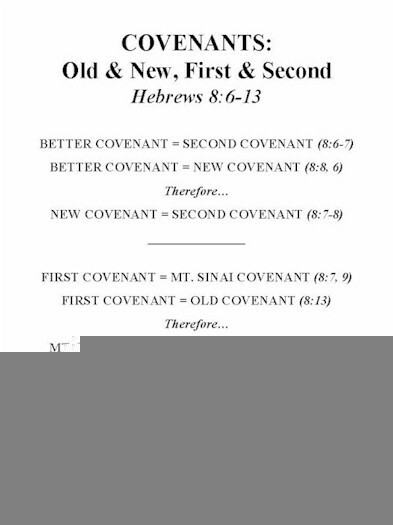 "New" necessarily implies the first covenant is old and about to vanish away - Heb. 8:13.
a. It was becoming old in Jeremiah's day! 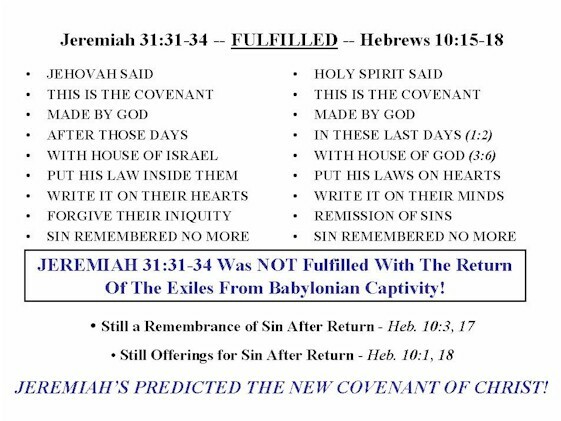 C. There Was A Remembrance Of Sins Under The Provisions Of The Old Covenant - Heb. 10:1-4. 1. Otherwise, Christ died in vain - Gal. 2:2 1; 3:21-22. 2. There would be no more offerings for sin if its provisions could solve the problem of sin -Heb. 10:18, 1-2. D. The Ten Commandments Were "The Words Of The Covenant" - Exo. 34:27-28 (Deut. 9:9); Deut. 4:13-14, 23; 5:1-3 (6-21). E. The "Book Of The Law" Was The Same As The "Book Of The Covenant" - 2 Kgs. 22:8, 11; 23:2. II. 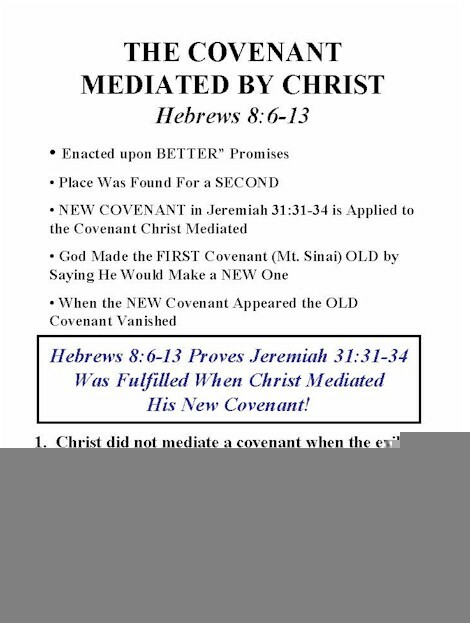 THE NEW COVENANT - Jer. 31:31; Heb. 8:8, 13, 12:24. A. There Is A New Testament. 1. Dedicated by the blood of Jesus - Matt, 26:28 (Mk. 14:24; Lk. 22:20; 1 Cor. 11:25); Heb. 9:15-18). 2. The apostles of Christ are ministers of it - 2 Cor. 3:6. 3. Christ is the mediator of it - Heb. 9:15; 12:24. B. It Did Not Exist Before The Death Of Jesus (Blood) - Heb. 9:15-17. C. Under It There Is Remission Of Sins - Heb, 10:15-18. 1. One sacrifice for sins forever - Heb. 10:12. 2. No remembrance of sin - Heb. 10:17 (cf. v. 3). IV. IS THE MOSAIC COVENANT A CONTINUATION OF THE ABRAHAMIC COVENANT? No! 1. Israel was given the Sabbath, and sinned when did they did not keep it (Exo. 20:8; 31:12-17; Num. 15:32-36). 2. Abraham was not given the Sabbath, and did not sin when he did not keep it (Deut. 5:2-3, 15; Neh. 9:13-14). 3. 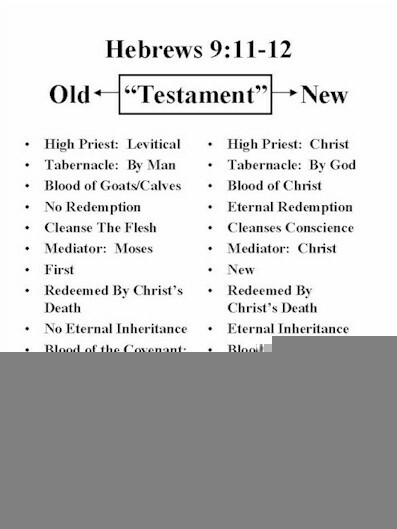 Therefore, the law of Moses was not a continuation of the Abrahamic Covenant! V. IS THE GOSPEL OF CHRIST A CONTINUATION OF THE ABRAHAMIC AND MOSIAC COVENANTS? No! 1. Abraham and his descendants were commanded to be circumcised, and failure to obey was sin (Gen. 17:14; 21:4; Lev. 12:3). 2. The gospel of Christ does not command fleshly circumcision (Gal. 5:6; Rom. 2:28-29). 3. Therefore, the gospel of Christ is not a continuation of the Abrahamic and Mosaic covenants! VI. IS THE GOSPEL OF CHRIST A CONTINUATION OF THE MOSIAC COVENANT? No! 1. Law of Moses permitted its practice, while limiting its extent and widespread occurrence (Exo. 21:7-11; Deut. 21:15-16). 2. The gospel of Christ does not permit polygamy (Matt. 19:4-6; Rom. 7:2-3; 1 Cor. 7:2; Heb. 13:4). 3. Therefore, the gospel of Christ is not a continuation of the Mosaic covenant!